Mr Fair said that he was writing to schools "in response to a number of letters I have recently received from some principals and parents". "While I appreciate that the majority of schools will continue to exercise budgetary discretion and firm financial management, some principals have indicated that, even in doing so, they may be forced into deficit positions," he wrote. "What is of more concern is that some have also stated that they will be planning for deficit budget positions over the next three years." Mr Fair went on to quote guidance "which clearly states that deficits (as well as large surpluses) must be avoided". "No school may plan for a deficit without the consent of the Education Authority," he continued. "I would be grateful if you could share the content of this letter with parents." In April, the head teachers wrote to the DE, the Education Authority and the secretary of state stating that the budget situation facing them was "untenable". 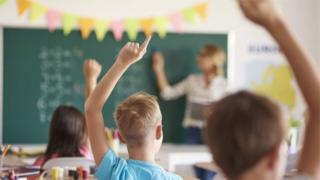 They also wrote to parents of all pupils in 43 schools, telling them that they could not make staffing cuts without "compromising" children's education. Mr Fair's letter, dated 9 May, is in response to those concerns. He had previously written to schools warning them that they would need to make "difficult decisions" in 2017/18.